Portraits and limited editions of horses, dogs, cats and people. 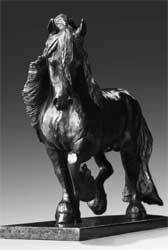 Allow at least 8-12 months for an original bronze sculpture. Click here to view portraits in bronze of horses, dogs and cats. Click here to see limited edition bronzes for sale. Click here to see limited edition resin castings for sale. Click here to see works in progress.